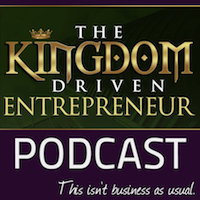 Co-hosts Shae Bynes and Antonina Geer interview me on their show the Kingdom Driven Entrepreneur. We talk about how I met Jesus at the age of 38 years old, and what it takes to bring the kingdom of God to the marketplace. I share one of my favorite healing testimonies and we discuss how to cooperate with the Holy Spirit. We talk briefly about traveling in the spirit and the persistence needed to operate in healing then wrap things up with a look at my current and future book projects.